It is nice to see a simple linear chart with dollar numbers that is easy to calculate. However, linear price scale may not be good for significant changes in stock prices if we calculate money in terms of return on investment (ROI). For example, the change $10 of SP-500 gives around 10% market performance in 1970 but the same $10 change is equivalent only 1% of SP-500 performance in 2010. So that be aware that big changes on linear graph can be misleading since they may not represent big ROI. 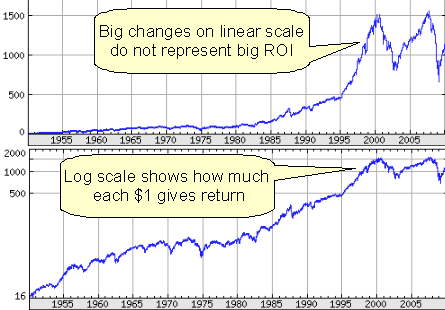 That is why logarithmic (log) price scales are used by many investors and technical traders. Log scale graphs correctly show in the percentage the rate of return-on-investment for both, small and big changes in prices. Log graphs show percentage changes accurately, since the same interval anywhere on the price scale represents the same percentage change. Such software tool, as Stock Market Analyzer-Predictor SMAP-2/3, works with multi-year periods. That is why it uses a logarithmic re-normalization.